Industry Insights: Does the UK need a Scandinavian approach to heating? Nu-Heat has been working with NIBE (a leading European manufacturer of sustainable energy solutions) to promote the adoption of the renewable energy and low flow temperature heating solutions for over a decade. Together, the two companies champion the winning combination of ground or air source heat pumps with warm water underfloor heating. 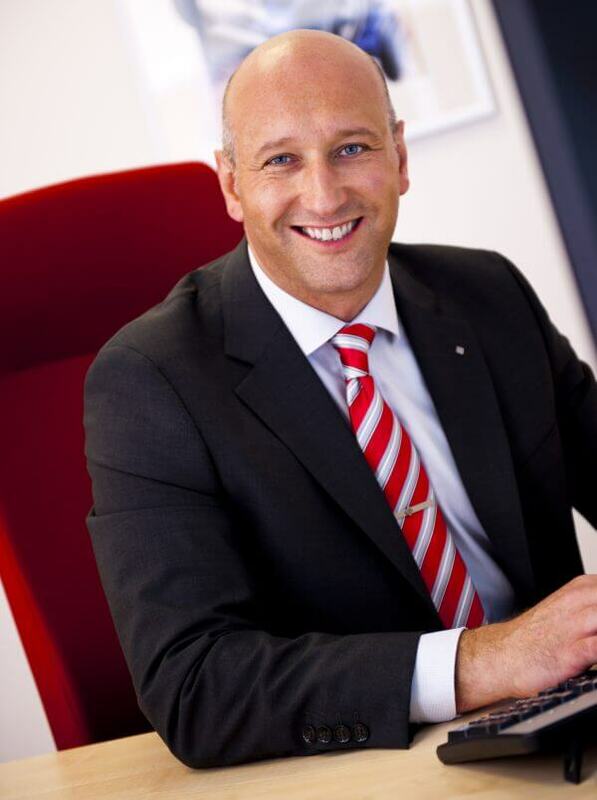 In the first of our series of Industry Insights, Phil Hurley, Managing Director of NIBE, considers whether a Scandinavian approach to heating could be the answer to the challenges facing the UK today. Sustainability, home building and the use of high carbon fuels are all hot topics right now, and recent Government announcements see the UK publicly striving for a greener, cleaner and more certain future. Government has promised to support sustainability in house building, committed to protect and ring-fence the RHI (Renewable Heat Incentive) budget until 2020/21, and pledged to phase out the use of high carbon fuels by 2030. These are steps in the right direction that offer a positive vision of the future, but what we need now is a clear plan that sets out how these ambitions are going to be achieved. How can heating make a difference? You might think that, in comparison to reducing carbon emissions from transport and waste, for example, choosing a more sustainable way to heat our homes might have little impact on the big picture. However, with the Committee on Climate Change estimating that almost a third of the UK’s total carbon emissions come from heating, there is real merit in making smarter heating choices. The ability of heating to help achieve the Government’s ambitious 2030 target should not be underestimated, but action needs to start now. A good place to begin is with building regulations and best practice for new build homes. As a nation that has committed to reduce its carbon footprint, it seems ludicrous that new homes built off of the mains gas grid are still being heated with oil, leaving homeowners with heating bills that are only ever likely to go up, and a heat source that is anything but green. Surely building regulations should reward, encourage and facilitate the use of renewable energy and lower flow temperature heating systems in these new homes? Accommodating renewable options like heat pumps, and lower flow temperature heating systems like warm water underfloor heating, would not only tick the box for sustainability and reduce carbon emissions, but reduce running costs for homeowners and allow them to benefit from RHI payments. We need to get to the point where sustainability is the norm rather than the exception. This is where our Scandinavian friends have the right idea. Take NIBE’s home country, Sweden, as an example. More than half of the country’s energy comes from renewables, and the use of heat pumps combined with low-flow temperature underfloor heating is prevalent. It is no wonder that Sweden’s carbon emissions are lower – and their ambitions higher – than the UK. The UK’s construction industry needs support to move away from ‘the way things have always been done’ and take the long-term view. Companies like NIBE and Nu-Heat can and do play their part in supporting installers and homeowners to make greener choices, but if we are to see a seismic shift towards sustainability – and meet the UK’s ambitious targets – then the rules of the game need to change. This is an achievable ambition, and there are many reasons to be optimistic. We are leaving behind the years of uncertainty caused by the financial crisis, and are once again seeing growth in the building sector. The confirmation of RHI budgets for another few years offers greater confidence for installers and homeowners alike – a confidence that is reflected in the growth of the heat pump market. We are starting to see recognition for lower flow temperature heating solutions in building policy. The UK has made a public commitment to delivering more sustainable homes. The time is right and the opportunity is there – all we need now is for actions to speak louder than words. Following on from our introduction to heat pumps part 1, we talk through the technicalities of using your heat pump system. How do I control my heat pump? 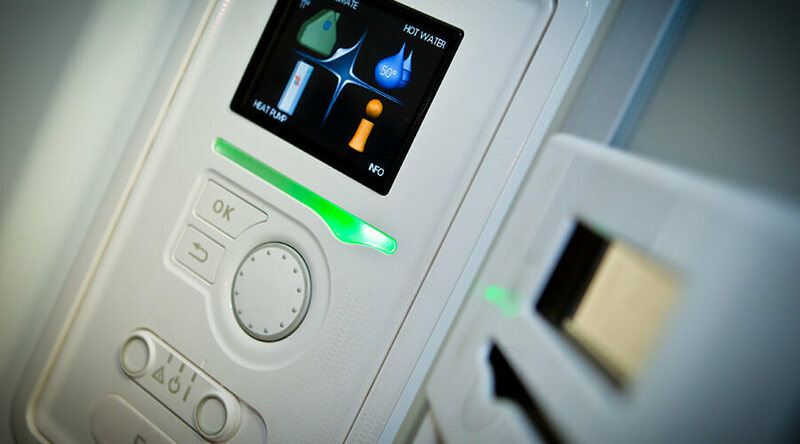 You can easily control your heat pump via a series of icons on the control panel that enable you to set heating and domestic hot water (DHW) schedules, as well as view live operating data and current temperatures. Every on-screen menu has a help button which provides clarification on each of the functions. All Nu-Heat heating systems come with a straightforward, comprehensive user guide as standard. Will my heat pump come with a warranty? Yes – Nu-Heat offer a choice of warranties to support your requirements. Your system will be designed to meet your specific property needs and to maintain your desired internal temperature even when it is -3°C outside. If you have any queries or concerns, you have access to free, expert advice from our Technical Support team. My heat pump is weather compensating – what does this mean? All Nu-Heat supplied air source and ground source heat pumps come with weather compensating technology. Weather compensation works by adjusting the amount of energy it uses to achieve the desired inside temperature, according to the outside weather conditions. For example, your heating system will not have to work as hard to achieve and maintain a set minimum inside temperature on a warm summer’s day as it would in the depths of winter. This is a more efficient alternative to a traditional central heating schedule, which will fire up the boiler to deliver heat to your radiators at certain times of the day or night regardless of the outside temperature, and only regulates the heat output according to the temperature of the water circulating around the system. Will my system provide enough hot water at peak times? The most efficient means of providing DHW for your home is to allow the DHW cylinder to remain ‘topped up’, with the heat pump operating to replace the used hot water. Most heat pumps can be set to switch on a standby electric immersion heater to ensure that there is no disruption to the hot water supply at times of high demand. What is a hygiene purge? Your Nu-Heat heat pump will automatically run a hygiene purge on any stored DHW once a day. This heats the stored water in the cylinder to a minimum of 60°C to eliminate the risk of harmful bacteria. If for any reason the system is unable to complete the scheduled hygiene purge, it will attempt to do so every day for another seven days, before displaying an alarm on the control panel. If you choose to upgrade your remote monitoring and control package, you will also receive an email at this point advising you to contact your installer. What is remote monitoring and control? This is an optional data package that allows you to monitor and control the performance of your heat pump remotely, and includes access to the last month of running data as standard. Additional remote control of your heat pump is available as an optional extra, allowing you to change settings or modes whilst away from home, and also receive email alerts from the heat pump if action is required. Will I still have heating when my heat pump is being serviced? Yes! There is a manual override function which maintains the UFH and DHW temperatures whilst the heat pump is being serviced. Electric back up heaters within the cylinder and buffer tank also ensure that heating and hot water can be maintained if the heat pump is in fault or cannot keep up with demand. 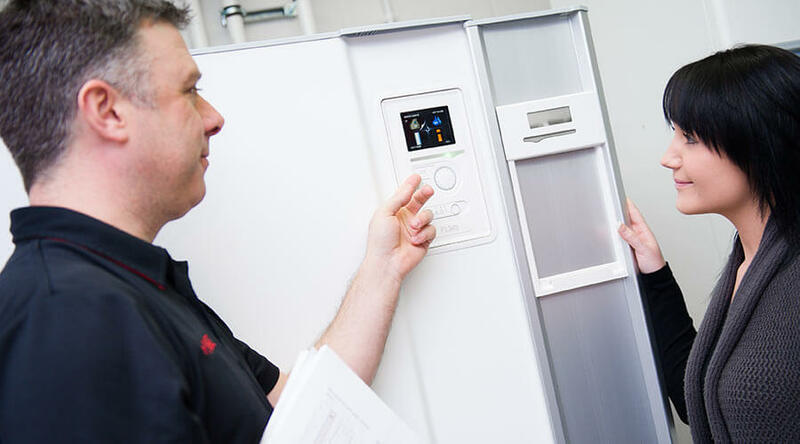 If you have questions about heat pumps that we have not answered here, please call 01404 549770 to speak to one of our technical experts, or email info@nu-heat.co.uk. Baffled by heat pumps? We take a look at the key considerations for installing a heat pump in your home. Heat pumps use the free supply of natural heat from the air or ground to generate domestic heating and hot water. 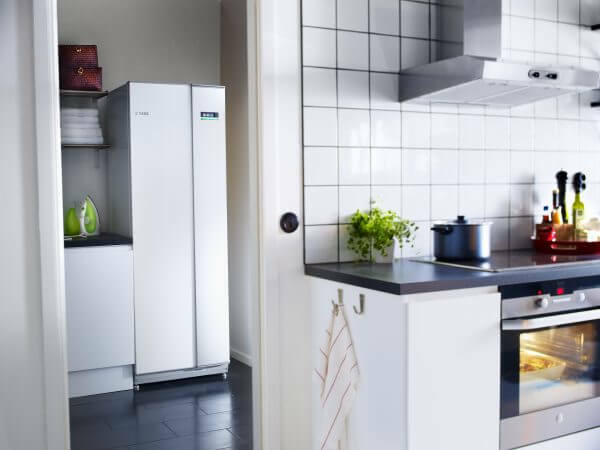 An efficient heat pump transfers significantly more energy into a property as heat than it uses to extract it from the ground or air, helping to lower fuel bills and reduce environmental impact. A buffer tank holds water heated by the heat pump which supplies the heating system. Rather than switching on and off, like radiators on a schedule, heat pumps maintain a constant, pre-set temperature in each room. The heat pump only increases the temperature of the water in the buffer tank when additional heat is required, and holds a minimum pre-set temperature when extra heat is not needed. Domestic hot water (DHW) is stored in a cylinder in much the same way as with a traditional central heating system. The water in the cylinder is heated by the heat pump and held at a pre-set temperature. A heat pump typically transfers three times the amount of energy into a property as heat than it uses to extract it from the air or ground, so has the potential to significantly lower your fuel bills. If you meet the Government’s Renewable Heat Incentive (RHI) scheme criteria, you can also receive additional payments to offset the initial cost of installation. A heat pump (whether air source or ground source) is a great eco-solution for any property, but is particularly beneficial to those without access to mains gas. Your property will need to be well-insulated in order for the heat pump to operate efficiently. If your property meets current building regulations it should be suitable for heat pumps without any alterations. Older properties may require additional insulation – check your Energy Performance Certificate to find out your property’s current insulation levels and any recommendations for their improvement. Are heat pumps compatible with underfloor heating? Yes! Heat pumps are at their most efficient when operating at lower temperatures, making this technology a perfect partner for underfloor heating (UFH), which operates at a much lower flow temperature than radiators. Heat pumps can still be used in conjunction with radiators, but the radiators would need to be oversized in order to heat the property adequately. What floor coverings should I choose? 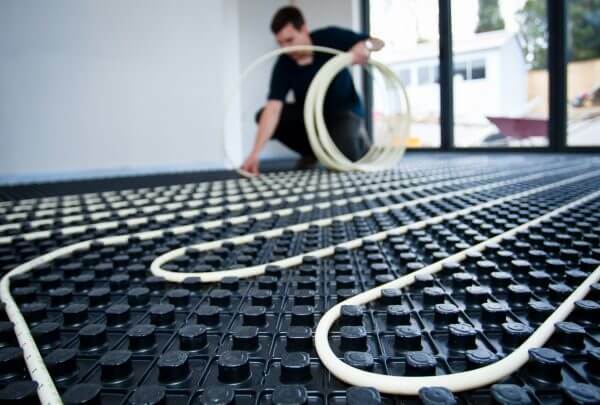 Heat pump powered UFH works best with high heat output floor coverings such as stone or ceramic tiles, vinyl or lino. If the floor covering has good thermal conductivity, the heat pump and UFH can operate at a lower flow temperature for optimum efficiency. How much room do I need for a heat pump? The amount of space you will need is different for a ground source or air source heat pump. A ground source heat pump (GSHP) will generally require an area of up to three times the total floor area of the property (ground and upper floors) for the installation of ground loops. If you don’t have sufficient land to accommodate ground loops, a bore hole is an effective – but more costly – alternative. The GSHP itself is installed indoors, along with a buffer tank and cylinder. The combination of these elements will provide all of the property’s heating and domestic hot water requirements, without the need for boiler back up. Air source heat pumps (ASHP) need to be positioned outside. Whilst less space is required for an ASHP than a GSHP, it is best practice to consider your neighbours and locate the heat pump at least 1m away from your neighbour’s boundary (3m if your property is in Wales). Bear in mind that your heat pump will need to work harder if it is situated in a cooler, north-facing, shady position, than if it is located in a southern-facing, sunny spot. The cylinder and buffer tank will need to be accommodated within the property. The cylinder is designed to sit on top of the buffer tank for a compact installation, and can often be housed in an area no larger than an oversized airing cupboard. Heat pump installations generally fall under permitted development rights, and planning permission is generally not needed unless the property is listed or located in an Area of Outstanding Natural Beauty. You will need to seek approval from your electricity supplier before your heat pump is installed. Nu-Heat’s Field Sales Managers are out on the road, visiting customers on site daily. We work together with the Account Managers to provide guidance and support on system specification and to help customers with any questions they may have. There are six Field Sales Managers in total and all have strong backgrounds in the plumbing and heating industry (totting up to more than 100 years! ), so have the knowledge and experience to advise the most efficient solution for any project. We are dotted around various locations across the country, so no matter where you are you can speak to us about a project face-to-face. Who can have a site visit? We visit a wide range of customers from architects, to help with specification of solutions; installers, to help build their technical knowledge and support their business; to the homeowner, to answer any questions about the solution we have quoted. Site visits can be particularly useful when we are able to meet everyone involved in the project – the homeowner, builder and plumber – to discuss the finer details of the system and how it will be designed and installed. When do you require a site visit? 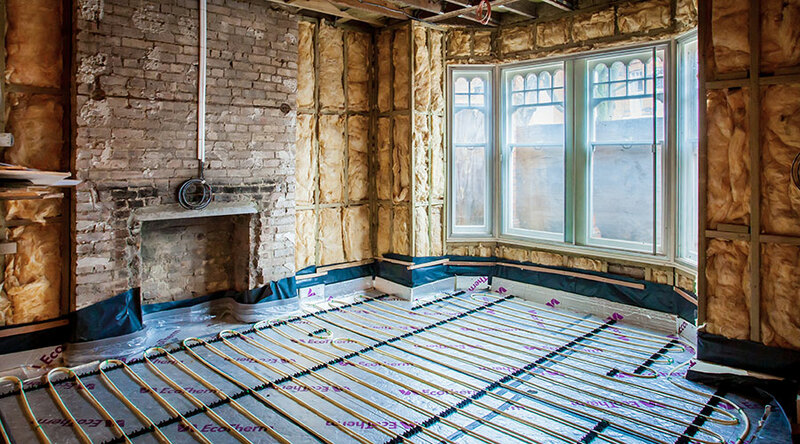 The majority of site visits tend to be for projects that involve a more complicated underfloor heating system or systems where there is an integrated heat pump or solar thermal. 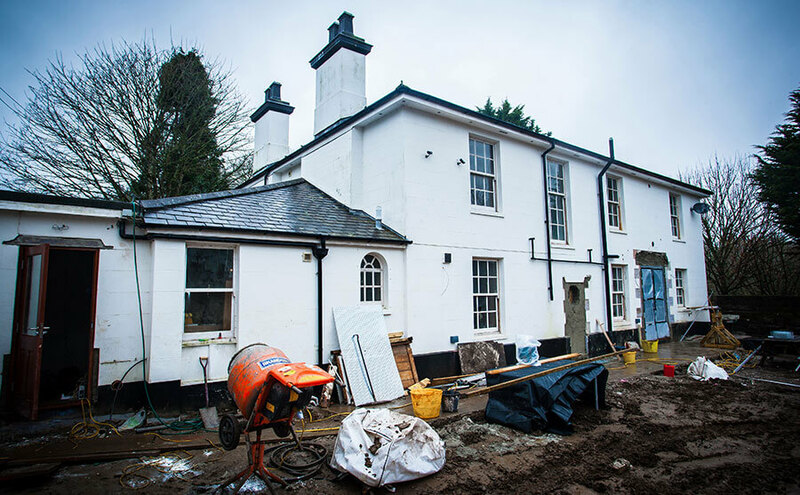 A site visit helps us to ensure that the solution will perform efficiently and also gives us the opportunity to answer any questions you may have. What happens on a site visit? This varies depending on the project. To begin with we will assess the site to check that the solutions being considered are cost-effective and will perform efficiently, as required. We also discuss the location for the system manifolds, outside spot for the air source heat pump, as well as any other indoor equipment associated with a heat pump installation. With more complicated underfloor heating systems, we use the site visit to ensure that we have specified the best possible floor construction for the project as this can’t always be seen from a set of drawings. Any customer with a project that involves renewables or a tricky underfloor heating installation can request a site visit – simply ask your Account Manager for more info or fill out the form on this page and we’ll get back to you. » You can find out more about the Field Sales Team in our ‘Meet the Team’ blog post here.